The year is now 1885; the age of steam is well over the horizon. sailing ships exercise a queer hold on the English imagination. There's nothing like the sight of a square-rigger for reminding even the weediest of chain-smokers that he's really a heart of oak; the rightful heir to the tradition of Nelson, Drake and the great maritime adventurers of empire. Our literature is steeped in sailing lore. Where Americans have Westerns and pioneers, the British have sea stories and captains courageous. and gasometers, she was making a royal stir. Factories emptied for her, as lines of men in boiler suits came out to watch her pass. She brought the morning traffic to a stop. People came dashing out of bungalows with Instamatics to get her picture; whole pools of typists stood framed in high windows, point­ing down. There was something at once splendid and absurd about her progress - a tall ship stuck, improbably, in a land­scape of 20th-century gimcrack. On board, her crew and pas­sengers were basking in the glow of her celebrity. The canal pilot - and pilots are usually as ! taciturn as clams - was babbling happily about her virtues. He spun the wheel, and she made a right-angled turn around the corner of a tyre depot. The pilot's thunder had been stolen, though. 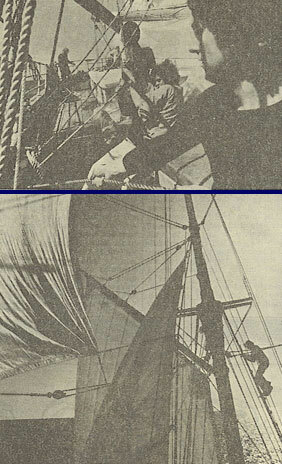 Scott, who at 17 was the youngest member of her crew, had chosen this particular moment to be hauled up the mainmast in a bosun's chair. 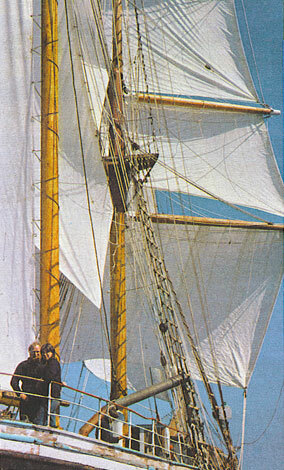 He hung there, covered in conspicuous glory, 40 feet up below the futtock-band, greas­ing the mast with tallow. Standing on the fo'c'sle with my fingers frozen, I knew that this wasn't my party. I belonged with the curious camera-clickers on shore, not on board this liv­ing symbol of hardihood and enterprise. As I got out of the way of someone doing peculiar things to a coil of rope, I felt an impostor in a cheerful, Philistine, outdoor world; a world where everybody except me was putting his shoulder to the wheel, mucking in, exchang­ing loud, extrovert, outdoor jokes, showing off an alarming quantity of technical knowhow. I went below to warm up. In the woody half-darkness of what had once been the ship's hold, I found a pile of copies of Yachting Monthly. Its macho prose didn't do much for my spirits.
. . . A good old-fashioned thrash down Channel and round Ushant . . . Our hopes rose. If the topping lift was trapped round the rudder then we stood a chance . . . I raised a passing tanker on the Aldis. ' 2182 ' I tapped out very slowly. But that brought no joy . . . We were on our own. On with the banker and northioard ho! As I gloomily faced the prospect of a good old-fashioned thrash down the Bristol Channel and round Land's End to Cowes, I wondered what on earth a honker was, and whether the Søren Larsen had a topping lift on board. Back on deck, I made a few cautious inquiries. Er . . . what exactly was the Søren Larsen? Technically speaking (and sailors speak no other way) she was a hermaphrodite brig. 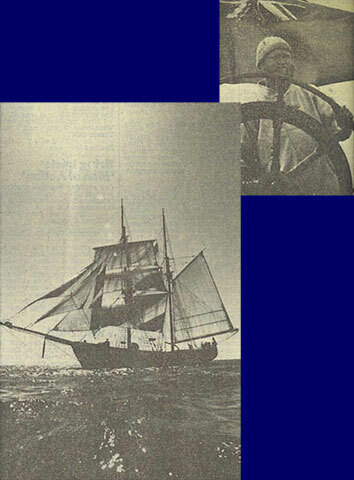 That meant that her front mast was rigged to carry square sails, while the mast at the back car­ried a single ' fore-and-aft' sail on a huge, swinging boom. It was a piratical rig; brigantines got their name from the Italian brigandini, who used them to escape capture by running fast with the wind. The Søren Larsen looked as if she'd just sailed out of a blood-and-thunder chapter in Captain Marryat or Robert Louis Stevenson. In fact, she was a sheep in wolf's clothing. She'd been built in Denmark in 1948 as a Baltic trader. 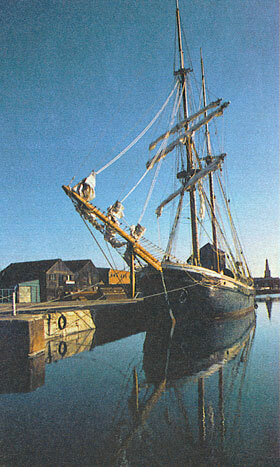 Her masts had been stubby, then, and she'd been rigged as a schooner, only using her sails to provide some ancil­lary power to her marine diesel. She'd carried 240 tons of general cargo, and most of her life had been spent tramping unromantically round the Baltic coast, heaving coal and scrap and sand to Hamburg, Stock­holm, Copenhagen and Helsinki. of the bull began to groan and flex. of his possession of her. restorers, had found her on a Thames slipway. There had been a fire in her wheelhouse; her sides were cracked and bat­tered; she had already started on that rapid downhill slide in which ships end up as a few bleached ribs sticking out of a mudbank. The Davies brothers had bought her, stripped her, and painstakingly transformed her into a working museum-piece which looked a good hundred years older than it really was. Now only her name gave away the fact that she wasn't a genuine survivor from the days of those Mariners of England/That guard our native seas/Whose flag has braved a thousand years/The battle and the breeze. The canal gave way to the Severn estuary, and the estuary opened out into a broken, muddy sea. Off Avonmouth we dropped the pilot. Under the bulge of Glamorgan we set sail. The crew, in oilskins and dungarees, went monkeying up in the shrouds, hauling on ropes, shaking the sails clear of their booms, busy as money-spiders in their web of cleats and shackles and stays and belaying-pins. There were nearly 6,000 squire feet of sails and about three miles of rope to handle - an operation roughly equivalent to hanging out 170 heavy king-size sheets on a gigantic washing line. To my eyes, it was pure chaos; a hopeless tangle of flapping Terylene, trailing ropes and scrambling people. I was keeping my head down. Tony Davies, at the wheel, was exhibiting what seemed to me to be an entirely unreasonable cool in the face of pandemonium. Noddy shinned down a rope, dodged a flying telegraph pole, and eased off the preventer. It was too. With all sails flying, the boat was suddenly as pretty and well-ordered as a ship in a bottle. The wind took hold, the bellies of the topsails stretched and thrummed, and the timbers of the hull began to groan and flex in the swell. The Søren Larsen was getting into her stride. There was an easy, lolloping rhythm about the was she took to the sea; getting her nose down, burrowing into the breakers and shaking them off with an upward wriggle of her stern. She really was something to be proud of, and Tony Davies shone in the pleasure of his possession of her. With his crew making every last rope fast, with the compass swinging in its gimbals, and the steady wind blowing out of Wales, he looked a very happy man. This wasn't my party. I belonged to the curious camera-clickers on shore, not on board this living symbol of hardihood and enterprise. As I got out of the way of someone doing peculiar things to a coil of rope, I felt an impostor in a cheerful, philistine, outdoor world; a world where everybody was mucking in. For the sake of the 'Søren Larsen' Tony Davies and his wife Fleur (above) were living in a draughty cupboard smelling of diesel oil; for her the crew lived a cheek-by-jowl sort of life in swinging hammocks up in the fo'c'sle ..... I could see her beauty easily enough, but she was a cripplingly expensive date and she subjected her lovers to such extremes of cold, wet and lack of privacy that I found their constancy bewildering. Other people's love affairs are often hard to comprehend. For him - as for nearly every-one on board - the Søren Larsen had been an exacting beauty. It was for her sake that Tony and his wife Fleur were living in a draughty cupboard smelling of diesel oil, just over the engine; for her the crew lived a piggy, cheek-by-jowl sort of life in swinging hammocks up in the fo'c'sle. The amount of sheer labour and discomfort which had already gone into her conversion was enormous; and there was much more still to come. At present the inside of the vessel wasn't much more than a windy shell; within the next year it would turn, bulk-head by bulkhead, into a palatial floating guesthouse. Even with everyone on board her working for love and pocket-money, the Søren Larsen was never going to do more than barely pay her way. I could see her beauty easily enough, but she was a cripplingly expensive date and she subjected her lovers to such extremes of cold, wet, long hours and lack of privacy that I found their constancy bewildering. Other people's love affairs are often hard to comprehend, but this passion for the Søren Larsen struck me as not far short of mad. The gentle two-step with which she'd started her sail had turned to a drunken stagger through the sea. Even her regular crew were going distinctly pale and silent. Fleur Davies had cooked a handsome dinner below, but few of us managed to finish it; and when I tried to do the washing-up, the sight of the greasy water slop­ping around the sides of the bowl sent me lurching to my sleeping bag on the floor under the hatch. Outside, Tony and John Perkins, the radio times photographer, were standing watch in an icy wind. Perkins had fallen in love with the Søren Larsen too. As I rolled uncomfortably between an oildrum and a coil of steel wire, it occurred to me that if I could simulate acute appendicitis I might just possibly get rescued by helicopter. I woke at halfhour intervals through the night, beset by a riddle: why should anyone be enchanted by this odious old beauty? There wasn't any single answer to the question. What was remarkable about the vessel was how, for each of her devotees, she was able to gratify a different need. For Andrew, a joiner-turned-shipwright, it was her material that counted. Wooden ships were the last refuge for the finest points of his craft. He was on board because he could join and caulk and plane and chisel her. Listening into the foreign language of shipboard. Not a word was spoken which did not touch on sailing; sailing stories, sailing jokes, sailing gossip, profoundly impene-trable sailing slang. Scott (left) wanted to be a marine artist. For hours on end he would sit up on deck sketching the 'Søren Larsen's' sails and rigging. To him she was quite simple the most tantalisingly beautiful object in his life. For Noddy, she was something else. He was a young rag-trade heir, temporarily off the leash from his father's fashion warehouse, a weekending adventurer. In the Søren Larsen he seemed to have found the rigour, and the boisterous society, of an old-fashioned public school. David was a middle-aged bachelor who kept an antique shop in Colchester. For him, the vessel appeared to provide a kind of close family life, in which he occupied the position of a muchteased honorary uncle. Scott came from a Merseyside shipping family; his father owned a fleet of tugs. Scott himself wanted to be a marine artist, and for hours on end he would sit up on deck sketching the Søren Larsen's sails and rigging. To Scott she was quite simply the most tantalisingly beautiful object in his life. To Tony Davies, she was a complete community, of which he was prime minister, chancellor and lord chief justice. He managed her economy, and held her together as a remarkably friendly and equable social unit. Designer, engineer, carpenter and navigator, he had built his own self-contained world out of a bare hull. It was a world as remote to me as that of Jupiter or Saturn. By breakfast-time, we were off Land's End. The sun was up, the Atlantic was making gentle trickling noises against our timbers, and a raft of sausages lay spitting under the grill. Still half-asleep, I listened in to the foreign language of shipboard. Not a word was spoken which didn't touch on sailing: sailing stories, sailing jokes, sailing gossip, profoundly impenetrable sailing slang. It was family talk, with that family humour in which everyone must be ritually joshed and ribbed. I nibbled at a sausage and heard myself asking dumb questions. The English coast was, I reminded myself, only three miles off our beam; had the visibility not been excellent, I might have measured the distance in light-years. Up on deck, alone, I sat watching the sea sluicing past the gunwale. The foam sizzled like fat in a pan. Even out in the ocean, we were drawing a crowd. Curious cargo boats came up close around our stern, their crews out on their bridges with binoculars. Dirty Panamanian coasters, pint-size Cornish trawlers, a Naval destroyer and a matt-black nuclear submarine all changed their courses to get a better view of us as we headed up the English Channel. Running before the wind under full sail we must have made the kind of spectacle which causes the most hardened old sailor to feel a sentimental twinge. It was like squiring Jacqueline Onassis down a street; and I could feel myself to be an object of resentful envy from one end of the horizon to the other. We were making six or seven knots. That is a fairly tame speed for an old lady on a bicycle; on a sailing ship, it is a tearaway pace. Our wake streamed behind us for more than a mile; wind cracked and drummed in the sails; the plumes of spray which we raised from our bows would have done credit to the fotains in Trafalgar Square. Racing past the Lizard, with a picnic spread out on the afterdeck, a mug of white wine in my hand and the musical swoosh of white water in my ears, I could almost, I thought, have fallen in love with the Søren Larsen myself. We sailed under a tangerine sunset, through another night and another day. 'Yes - perfect,' I said, feeling a fink. My last sight of the Søren Larsen was when she lay at anchor off Cowes. I was in a speeding hydrofoil, and the Søren Larsen was up to her old tricks as an enchantress. Seen through the hydrofoil window, with the water winking under her bows, her fine tracery of shrouds and spars standing out against the sky, she was irresistible. At that moment, I would have paid dearly to be allowed to sail on her. I shall be content, though, to admire her from a safe distance, on television. I've learned one good lesson from her: whatever blood-group courses through the veins of Nelson, Drake and Edward Heath seems to have mysteriously missed mine.